Robert Jackson Bennett is one of those authors who attracts a huge amount of acclaim for his books, and after readingFoundryside, I can see why. It's an epic, breathtaking novel that's as much cyberpunk as it is fantasy. We follow a desperate thief named Sancia Grado, who is hired to steal a mysterious box from a warehouse. Sancia has a special ability — she can sense magic imbued in objects, which makes her job easier in a world where magic is everywhere. Bennett lays out a fantastic story ladened with fantastic characters, but it's his take on magic that stands out here. It's treated a bit like computer code, and in this world, people use it for everything: to strengthen city walls, to provide city lights, and imbue weapons with greater powers. Sancia stumbles on a plot to use this power to utterly remake the world, providing a chilling commentary on the lengths that people and corporations will go to ensure that they remain in power. A long-standing trope in science fiction is that moment when humanity first meets life from somewhere else in the universe. That's thefocus of Sue Burke's debut novel,Semiosis, which recognizes that alien life likely won't take the form of a bumpy-headed alien, but something that we might not recognize as intelligent at first blush. Such is the case here: a spaceship departs from Earth with the mission to build a utopian civilization on a new world. But when the colonists crash-land on a planet named Pax, their focus becomes surviving among the planet's hostile plant-life. Burke's novel jumps from generation to generation, following the colonists and their descendants as they realize that not only are they not alone, but that co-existence is a difficult proposition. One of the more delightful science fiction worlds to hit bookshelves in recent years is Becky Chambers'Wayfarers'trilogy — a series of books set in the same world, but which otherwise stand alone. The latest isRecord of a Spaceborn Few, which follows the descendants of the last flotilla of starships to depart Earth, who have clung to their way of life aboard the aging fleet. Chamber's novel is a beautiful look at a community that is grappling with impending change. It opens with the destruction of one member of the fleet and follows the paths of several characters — parents, newcomers, alien researchers, and others — who work to make their way through life. At its core, the book takes an optimistic view of the importance of traditions and one's way of life, but the equal importance of bending to change with circumstance. Myke Cole started his career with hisControl Pointtrilogy — a military fantasy series in which magic appears in the real world. His latest foray is a grim jump over to epic fantasy withThe Armored SaintandThe Queen of Crows, the first installments of a trilogy that are pointed tales on the dangers of fascism. What if the stakes of the space race were higher?In the opening chapters of Mary Robinette Kowal's latest two novels, an asteroid lands just off the US Eastern Seaboard and threatens to drastically change the climate. To save humanity, the US and partner countries embark on an ambitious plan to colonize the Solar System. In the midst of this is a WASP pilot named Elma York, who has the skills and ambition to assist with the effort. In the first novel, she faces systemic sexism and racism as she works to break into the astronaut corps as they set their sights on the Moon. In the second, she joins the first mission to Mars, and contends with not only the challenges of spaceflight, but the attitudes and biases of her crew. These two books are the first steps into a vivid, exciting world, and fortunately,there's more to come. R.F. Kuang's debut novelThe Poppy Waris the promising opening salvo for an upcoming military fantasy trilogy inspired in part by the atrocities that occurred during the Second Sino-Japanese War. It follows a bright young woman named Rin who earns admission into the Nikara Empire's elite military academy, Sinegard, an escape from servitude in her impoverished province. Once she arrives at the school, however, she finds that the road before her will be difficult: she contends not only with her classmates' racism and a challenging course load at the school, but the onset of a brutal and horrific war. As she enters the fight, she learns that power comes at a horrific cost. Earlier this year, N.K. Jemisin become the first author — ever — to earnthree consecutive Hugo Awards for Best Novelfor herphenomenalBroken Earthtrilogy. While we wait for her next novel, she's brought together a collection of her short fiction,How Long ‘Til Black Future Month? In 'The City, Born Great, a young man comes to terms with his status as the manifestation of New York City, while in 'Red Dirt Witch a mother faces down a powerful creature that represents white supremacy, and is forced to contend with the sacrifices that she and her family must make to ensure that they have a future. For fans of herBroken Earthtrilogy, there's also 'Stone Hunger, in which a girl will stop at nothing to hunt down a man who destroyed her life. The rest of the collection's stories are just as fantastic and timely. Set in the distant future, humanity survives on a planet wrecked by climate change and plagues in Larissa Lai's latest novelThe Tiger Flu, which follows a community of cloned women who are battling for their very survival waged by illness and economics. Lai's story follows two women: Kirilow, a doctor of Grist Village whose lover Peristrophe dies of a new strain of flu. Peristrophe was vitally important to their community — she could regrow her limbs and organs, and following her death, Kirilow sets out to Salt Water City to try to find someone to replace her. There, she meets Kora, a woman living in the city who might be able to save her community, but who resists leaving her family behind. Lai's story is an intriguing post-apocalyptic novel, one rife with biotech and the remnants of the world from before. Cixin Liu is best known for his fantasticRemembrance of Earth's Pasttrilogy —Three-Body Problem,The Dark Forest, andDeath's End —which begin in the 1970s and run all the way to the heat death of the universe. In his latest novel, Liuexplores how obsession can lead to dark and dangerous places. The book follows a young man named Chen who witnesses the death of his parents in a freak accident — they're incinerated by a ball lightning strike. The incident leads him down a path to study the phenomenon, leading him across the world. Along the way, he meets an obsessive army weapons engineer named Lin Yun, who wants to harness the power of ball lightning into a new weapon. Liu approaches the story with the same interest in physics and technology as his other books, and highlights the dangers that power and technology can bring. Rebecca Roanhorse made a splash earlier this year when she won the 2018 Hugo and Nebula Awards for her short story 'Welcome to Your Authentic Indian Experience TM.Her debut novelTrail of Lightningis a dazzling urban fantasythat puts indigenous culture front and center and sets up an incredible world. The book follows a Native American woman named Maggie Hoskie in Dinétah, the traditional homeland of the Navajo tribe. Protected from the chaos of climate change and war by massive, magical walls, she's one of a small group of people who have exhibited magical powers and finds work as a monster hunter. When a magical construct snatches a young child from a village, she realizes that there's a powerful force that threatens her community, and is pulled into the struggle to stop it before they're wiped out. Cixin Liu might be one of the best-known Chinese science fiction authors, but there's a growing effort to bring more fiction from the country to the West. Wellesley College professor Mingwei Song and UCLA professor emeritus Theodore Huters have assembled a fascinating anthology of some of the contemporary stories coming out of China today. 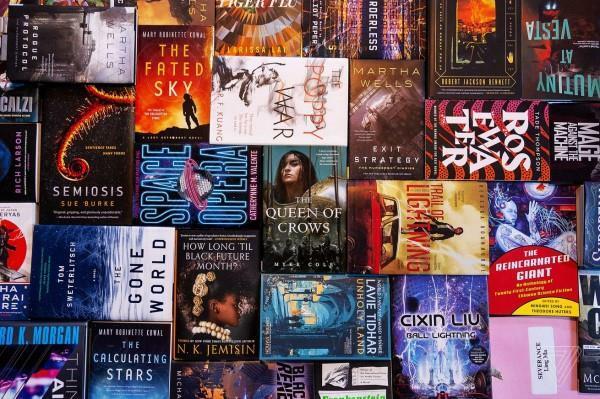 Those include established authors like Cixin Liu, but also newcomers like Chen Qiufan, Xia Jia, Bao Shu, and others, telling stories about alternate realities, other societies, and potential futures for the ascendant nation. The stories range from interstellar wars, messages from a long-dead human race, as well as AI, robotics, and cybernetics. The stories represent just a slice of China's science fiction community, but it's an engrossing window into a fascinating body of work. Time travel is a tricky proposition — science fiction has endlessly explored the possibilities and consequences of changing the past or future, and Tom Sweterlitsch's book is a complicated take on the trope. Sweterlitsch opens in the 20th-century with a time-traveling NCIS agent named Shannon Moss who is tasked with investigating a particularly gruesome murder. Moss jumps back and forth in time to try to unmask the killer, exploring different timelines and suspects. It's a vivid, complicated story that blends crime fiction with cosmic horror that doesn't release you until the last page is turned. Comedy in science fiction is often a tricky thing to accomplish — it's hard to live up to the likes of Douglas Adams'Hitchhiker's Guide to the Galaxyseries. But Catherynne M. Valente accomplishedthat and more with her novelSpace Opera. 'Space opera is the catch-all term for the type of science fiction novels set in big galactic empires or following starships as they work their way across space. Valente turned it into an excellent pun after aconversation about Eurovision. The book follows a washed-up glam rocker named Decibel who is brought on to represent Earth in a Megagalactic Grand Prix — an interstellar music competition that will judge whether or not Earth can join the greater galactic civilization. It's side-splittingly witty and wonderfully written, with almost every line in the novel telling a story of its own. Martha Wells' firstMurderbotnovella,All Systems Red, came out last year, and was a huge hit — eventually earning the 2018NebulaandHugo Awardsfor its category. This year saw the rest of the series hit bookshelves, continuing the story of the grumpy-but-good-hearted security android that calls itself Murderbot. Each story roughly stands on its own, but they make up a larger story in Wells' universe, following Murderbot as it bounces from planet to planet and tries to figure out its purpose in the universe. Along the way, it finds itself helping people caught up in conflicts against the domineering mega corporations that rule the space lanes, and ultimately helps to take down one that's been gunning for its friends. While this series has wrapped,Wiredjust published a new Murderbot short story, andWells is hard at workon a new novel about the character. Children of Blood and Boneby Tomi Adeyemi;Space Odyssey: Stanley Kubrick, Arthur C. Clarke, and the Making of a Masterpieceby Michael Benson;The Only Harmless Great Thingby Brooke Bolander;The Black God's Drumsby P. Djèlí Clark;European Travel for the Monstrous Gentlewomanby Theodora Goss;Points of Impactby Marko Kloos;The 2020 Commission Report on the North Korean Nuclear Attacks Against the United States: A Speculative Novelby Jeffrey Lewis;War Cryby Brian McClellan;Time Wasby Ian McDonald;Severanceby Ling Ma;Black Star Renegadesby Michael Moreci;Astounding: John W. Campbell, Isaac Asimov, Robert A. Heinlein, L. Ron Hubbard, and the Golden Age of Science Fictionby Alec Nevala-Lee;Star Wars: Last Shotby Daniel José Older;Gunpowder Moonby David Pedreira;Bandwidth/Borderlessby Eliot Peper;Gods, Monsters, and the Lucky Peachby Kelly Robson;Head OnandThe Consuming Fireby John Scalzi;Vengefulby V.E. Schwab;The Book of Mby Peng Shepherd;The Sky is Yoursby Chandler Klang Smith;Mutiny at Vestaby R.E. Stearns;Rosewaterby Tade Thompson;Unholy Landby Lavie Tidhar;Mecha Samurai Empireby Peter Tieryas;Side Lifeby Steve Toutonghi;The Cabin at the End of the Worldby Paul Tremblay;On a Sunbeamby Tillie Walden;TheFreeze-Frame Revolutionby Peter Watts; andThe Descent of Monstersby JY Yang.